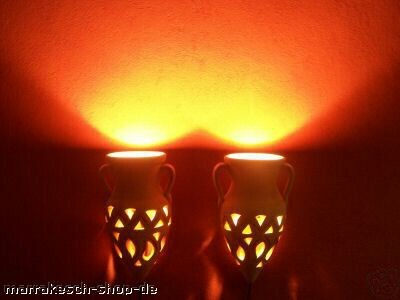 as wall lamp, lantern or simply as decoration, these are particularly appealing handmade amphorae used. Terracotta - a further artistic handicraft from Morocco. Here beauty is combined with practicality. Bring home a piece of Moroccan clay. 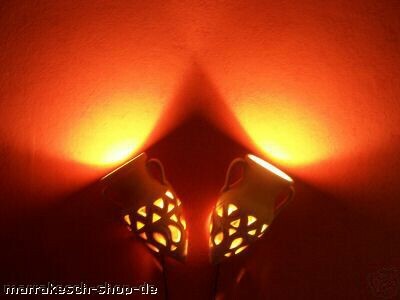 With our attractive and beautifully shaped terracotta wall lamps produced from clay. Clay. Extracted from the soil of this country. A natural product. The naturalness is even further highlighted by the individual handwork, where every item is unique and every specimen is a part of this country of the sea and the persons who live there. Each piece is unique in its design and was prepared with a great attention to details, in small factories, by skilled craftsmen in India.